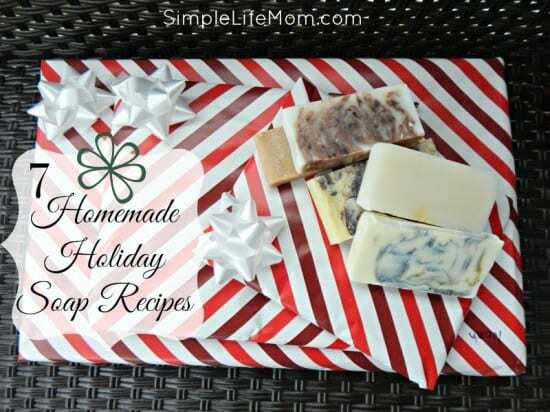 You can still make these 7 Homemade Holiday Soap Recipes from scratch and have them ready in a day or two. How? You can Hot process them! Here’s instructions for Hot Processing Soap and a Video Tutorial. I thought it would be a lot of fun to have soaps in out kitchen and bathrooms that add to the Christmas atmosphere of our home. After all, every time you wash anything you get that great evergreen, cinnamon, clove, or other scents that make you think of the Holidays, whether it be Thanksgiving, Christmas, or to help you get through the winter. The big issue: How to make these soaps that remind you of the Holidays with all natural oils and NO Fragrance oils. If you’ve been making soaps with Fragrance oils I would suggest you read This Article to learn more about them and their possible dangers. It actually wasn’t that hard. There are so many essential oils with amazing scents!! 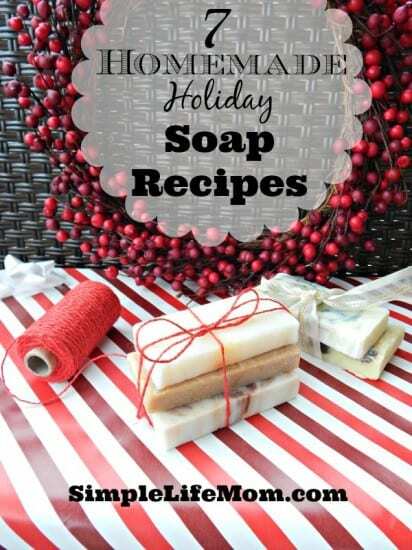 Check out the 7 Homemade Holiday Soap Recipes below for some great ideas. All of these soaps make a small batch (so you can try them all) of 2lbs. At trace, remove an ounce of the soap and stir in cocoa powder until there are no clumps. Swirl into poured soap. Add honey at trace with essential oil and stir in until incorporated. At trace, remove an ounce of the soap and stir in spirulina powder until there are no clumps. Swirl into poured soap. You can add the rosemary into the soap, or wait until it has gelled and add it onto the top (pushing down slightly to make sure it sticks). Pass this article on to your friends by using the links below! Mmmmm… I can smell them now! I think the Fir and Rosemary would be my favorite, but then Clove and Orange Spice would come in a close second! Thanks for these recipes! I have just started “soaping” and am thoroughly hooked! love pretty soaps! and love simple. I’m picky but simple!!! 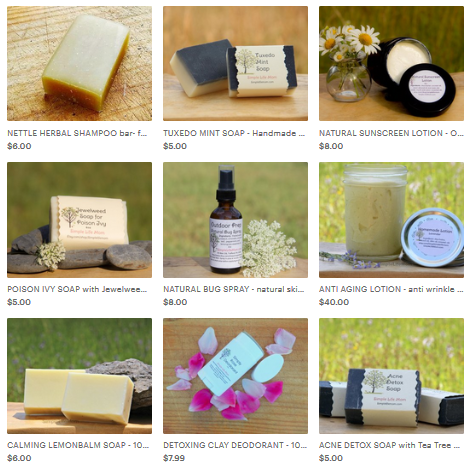 Love the cinnamon soap recipe. Cinnamon is well known to reduce hair loss and stimulate hair growth so this would be great for that. Cinnamon in it’s leaf oil form is apparently what works by stimulating blood circulation on the scalp that creates better conditions for hair regeneration. Of course try to use good quality steam distilled Ceylon Cinnamon Leaf Oil. Is there another oil you recommend using besides the beef tallow? Maybe olive oil, soybean oil, ect..? Tallow is a hard fat, making a harder soap. You cannot simply swap it out with another oil without adjusting other ingredients. You can substitute Palm oil for tallow though. Just found your site, and I was wondering if Beef Tallow was Crisco? Tallow is Beef. Lard is Pork. Crisco is soybean (gmo with heavy pesticides) and palm oil. I’ve never tried making soap, but this sounds like a wonderful project for the holidays. Great! Let me know if you have any questions. I was just asking about oils and soap…not sure I want to use my expensive ones. Great post!! Hi, I was wondering where you buy your grass fed Tallow at? There is not a link? I get it from a friend. You can ask around at some farms if you don’t know someone. What gorgeous recipes Kelly. I want to make soap for Christmas gifts this year so your post is very timely. Thanks so much for sharing at Thriving on Thursdays last week. I’m featuring your post at tomorrow’s party. Thanks again. I know what I’ll be doing this week! Hi! ´d like to know wich oil can I use instead tallow, lard or palm oil. I better preffer something organic. Thank you very much for your advise. I render my own fat from grass fed cattle. A lot of time you can look online for farmers around you and ask them if they have suet for you to render for the tallow. Otherwise you need to change the entire recipe. Look for a castille soap recipe. It is mainly olive oil. Of course, olive oil has been controverial lately as well. 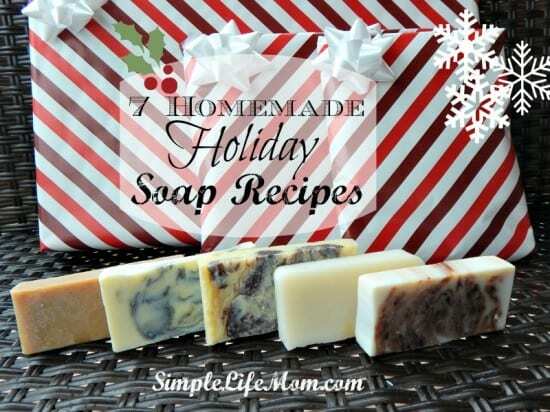 So I stumbled on your blog while looking for recipes for DIY soaps to give my family for Christmas. This is my first time doing soap and I’m curious if the ingredients would work in melt-and-pour soap bases. I bought a goat’s milk one and want to stick with that for my first soap trial. Sure, you can use the base and then add any essential oils or natural coloring, just pay attention to any volume difference so you know how to adjust the amount of e.oils. Dear Kelly. Thank you for the great recipes. 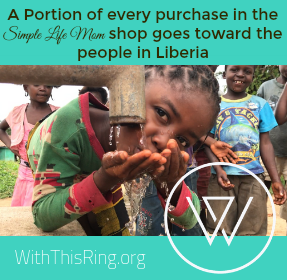 I tried the basic soap and waiting for them to cured. Now i’m ready to make the Christmas gift but I can’t find beef tallow here, what should I replace the tallow with? Kelly, these are some great recipes! Can I replace the 20 oz grass-fed beef tallow or lard with olive oil? No, it will completely change the recipe and how much lye is needed. It also makes a softer and less bubbly bar. You can take it as a starting point and run it through a lye calculator like on soapcalc.net. Just change it to ounces and add the ingredients and amounts, then make your changes and see what the next page tells you about your recipe (how much lye and water you’ll need plus if it’s hard, bubbly, etc. ).